From the time I was in grade school all the way up until after I graduated from college I wrote in notebooks. It seemed such a natural process that I wonder now how I got away from it, and why it was such a revelation when I took up writing in notebooks again. In my school days I used to carefully comb through available notebooks and select one with multiple subjects, college-ruled. Usually it would be a spiral-bound Mead, 8 1/2 by 11, but sometimes I’d experiment with slightly smaller sizes. 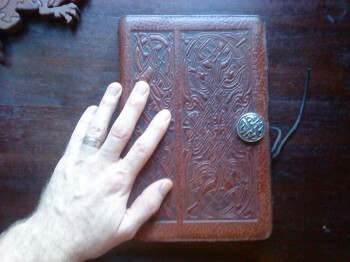 When I was older and wandering through the Kansas City Renaissance Festival with my wife, I purchased a lovely Celtic leather notebook cover with an unlined sketchbook, and I filled a succession of replacement sketchbooks between those covers with my scribbles for years after. As striking as that notebook was, though, I eventually fell out of using the thing. It became impractical to drag it wherever I went: my student days were over so I no longer had a backpack over one shoulder, and I didn’t have the kind of job where I always toted a briefcase. In those rare instances where I DID have a briefcase, it was already so loaded down that something weighing as much as a hardback book was a nuisance. I never used a notebook for writing unless I was at home, at which point I might as well have been writing on the computer. I thought that I had “outgrown” the use of a notebook. 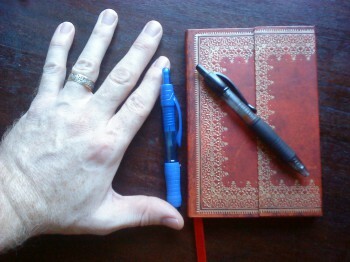 Paperblanks Mini notebook, with Pilot G-2 mini and Papermate Profile mini pens. I’d gotten away from the purpose of notebooks. In the last two years I’ve rediscovered just how useful they are to me as a writer, and I’ve been trying to evangelize my writer friends ever since. Waiting on a really slow train to get by on the tracks? Waiting in a plane? Waiting for your kid to get out of a music lesson, or stuck in traffic? Maybe, like me, you’re waiting for your friends to get out of a panel at Dragon*Con you weren’t interested in attending, or you’re out back fixing the horse fence. Writers write; they don’t just compose when it’s convenient for them, when the stars are in alignment, or when they happen to be sitting in front of their computers. Snatches of dialogue, scenes, entire outlines can be lost because the muses don’t wait to inspire you until you’re in just the right place with just the right tools. I don’t mean to suggest that we are powerless before the goddesses of inspiration, nor do I mean to belittle the ability to simply sit down and focus and make writing happen even when you’re having a slow day. Writers have to be able to make writing happen, not to wait for it to happen. What I’m advocating is having a small notebook (and a mini-pen — those things don’t break when you sit on them, and can fit in a front jeans pocket) ready with you so you can be ready to write rather than NOT write, which is infinitely easier. Whipping out your pen and notebook is much faster than rifling through your laptop or mini-laptop case and waiting for the computer to cycle on. In many of the instances I described above, firing up a computer would be impractical enough that you’d probably leave the writing for later. 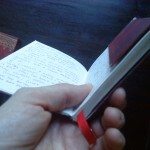 Sideview of the Paperblanks Mini notebook. I rediscovered notebooks while my family and I were wandering around the art museum bookstore in Cincinnati and I saw a display selling 3.75 by 5.5 notebooks. They were lined, the pages were sewn into place so they’d be less likely to fall out, and the covers were slim but durable. They were small enough to slide into my back pocket, where us American men-folk often keep our wallet. It was a spur-of-the-moment purchase of something I didn’t think I needed, and I actually felt a little guilty spending the money. I haven’t felt guilty about the purchase since. I swiftly learned that I had found an ideal writing tool. I get all kinds of good work accomplished because of the thing, most especially outlining. I’ve found the notebooks especially useful for “thinking aloud” to solve problems I wouldn’t usually solve while in front of the computer screen. For instance, I often write in outline form what would happen if I followed this plot thread this way, and then this other way, and then that way, which has saved me from going down even more dead ends with my writing than I would normally. 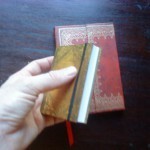 The diminuitive Paperblanks Micro notebook. I’ve found these little notebooks so handy that I filled one notebook last year and have only a few pages left in my current model. I’ve already picked out a replacement. I’ve looked at other brands, and seen that Moleskine, amongst others, has an equivalent size that might suit you. I’ve been very happy with my first choice, Paperblanks, though. They’re durable enough to last me a year, come with a built-in bookmark , lay flat pretty easily, and even have a sturdy pocket on the inside back cover where you can drop index cards or important scraps of paper (in fairness, it should be pointed out that Moleskines seem to have all these features as well). Paperblanks come in an array of styles sure to suit a variety of customers, and are available in larger (and even one smaller!) sizes. I’ve found Paperblanks, Moleskines, and other brands at major bookstore chains, although they also can be ordered at online venues. I’ve paid between 9-12 dollars for one, which is why I first thought they were an extravagance. I’ve since realized that the right tool is worth the extra price. That lack of recent updates has to do with me busily at work revising the second novel of Dabir and Asim. It is now with the publisher, and I’ve started work on the short story collection that will appear in e-form prior to the release of the second book, The Bones of the Old Ones. I’ve been pretty busy talking to interesting people about both The Desert of Souls and Plague of Shadows. I’ll provide the links below. Near the end of last week I joined Rone Barton and Ed Healy for some questions about Plague of Shadows, and discussed why Scott Oden and I have never yet been seen in the same place at the same time. The Pathfinder novel line gets discussed at length, and Dave Gross, Robin D. Laws, and James Sutter are all asked about their own work as well.